G'MIC (GREYC's Magic for Image Computing) is a framework for image processing that comes with a large number of pre-defined image filters and effects (almost 400, with an extra 300 testing filters). 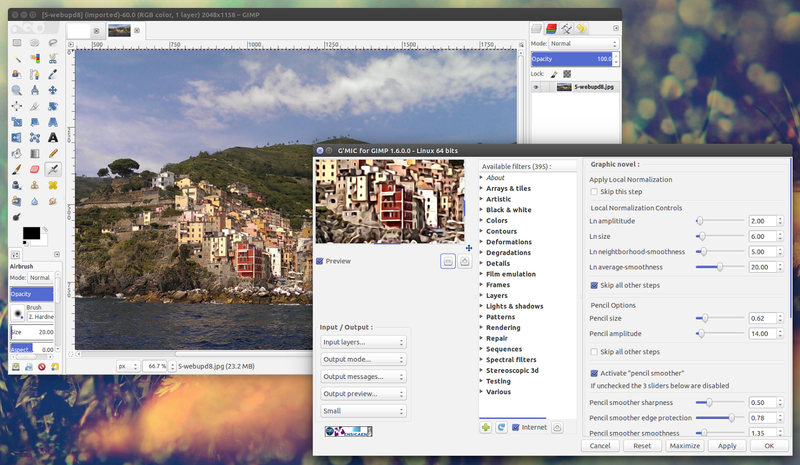 There are several interfaces for G'MIC: a command line tool, a web service, a Qt based interface for real-time webcam manipulation, a library and a GIMP plugin. bug fixes and much more. A complete list of changes for the latest G'MIC 1.6.0 can be found HERE. Once installed, open a photo in GIMP, go to Filters > G'MIC and a dialog will pop-up from which you can select the effect(s) you want to apply. Each effect is of course customizable and you can see a live preview in the G'MIC window. For other Linux distributions, Windows and Mac OS X, see the G'MIC downloads page.